Here's another simple crocheted garment project involving motifs. This is a simple sleeveless top made from triangle motifs. The motif is quite pretty because it has a 3-D flower design. 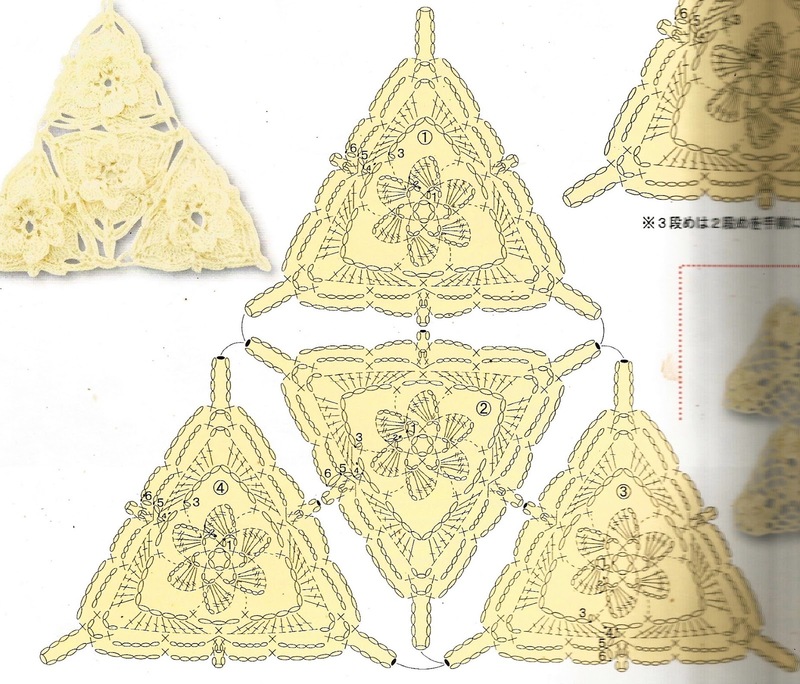 I modified this motif pattern slightly in order to make a strong fabric with smaller holes. 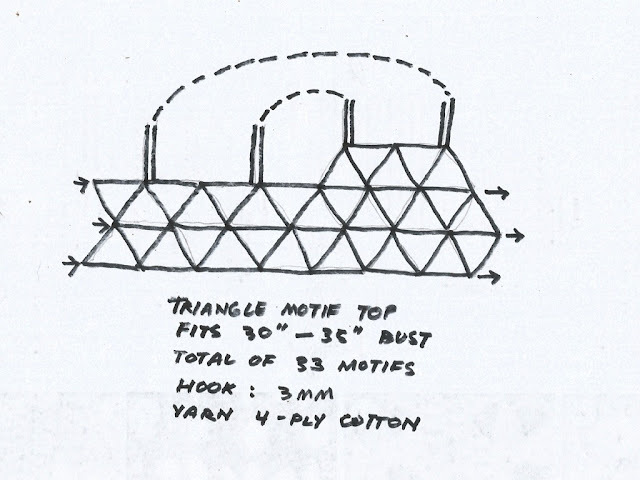 Here (above) is a schematic of the triangle motif. You can see that the motifs are joined along three points at each side. 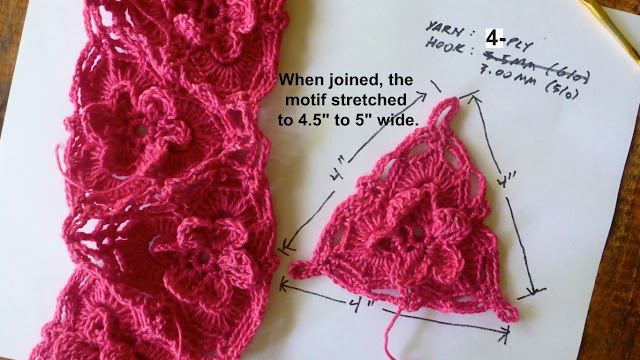 I wanted the motifs to join along more and at closer points along the sides in order to make a crocheted fabric that is strong and not too open. Below is the modified version of the pattern. This is what I would like to use for a crocheted garment. 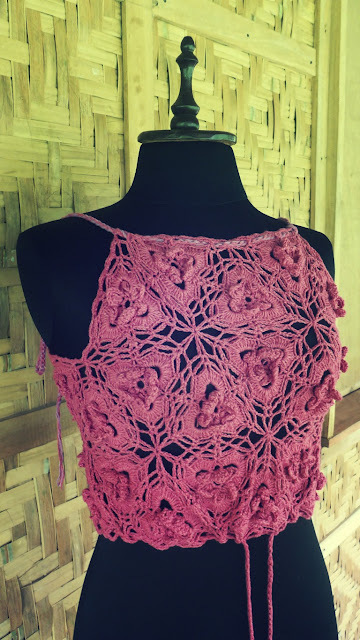 I originally planned to make a dress with this beautiful motif but I didn't have enough yarn, so I had to settle for a sleeveless cropped top. The yarn I used is 4-ply cotton and the hook is 3mm crochet hook. 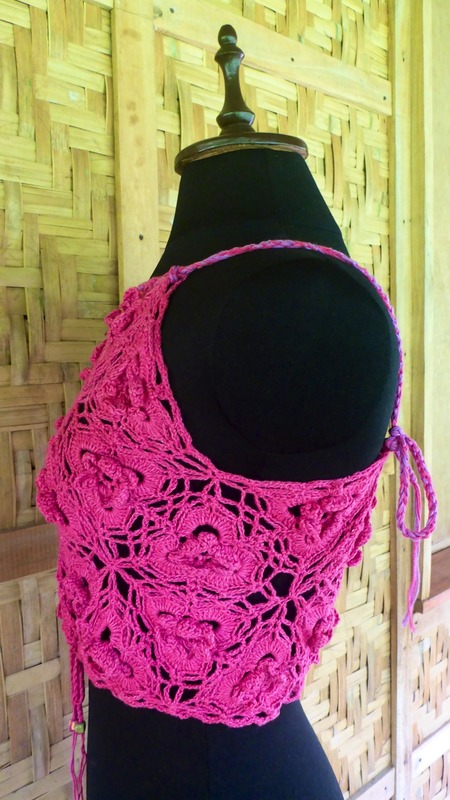 I used less than 200 grams of yarn for this sleeveless top. Below is the gauge, showing the motif measures 4" across. 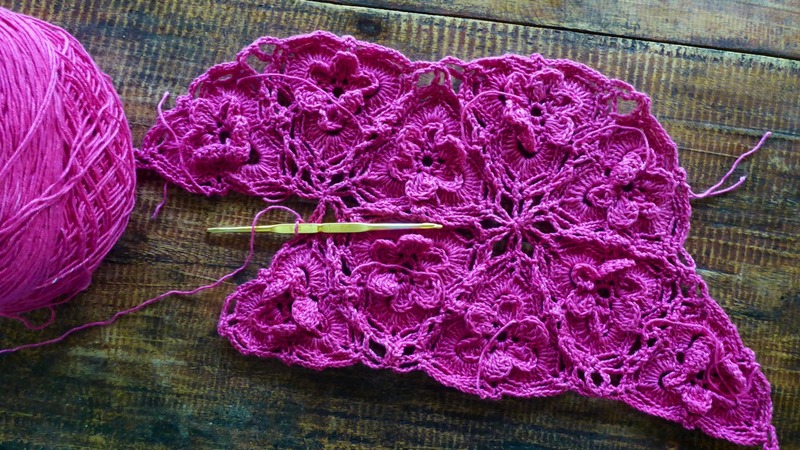 However, when the motif is joined together, the weight of the yarn pulls the motif and extends it to 4.5" to 5" wide. Here below is a diagram showing the layout of the motifs. This should make a garment that fits a bust 30" to 35". I have made use of adjustable straps and a tie at the bottom of the garment in order to accommodate the smaller sizes. This will be shown in the succeeding photographs. Here is joining the motifs in progress, join-as-you-go. 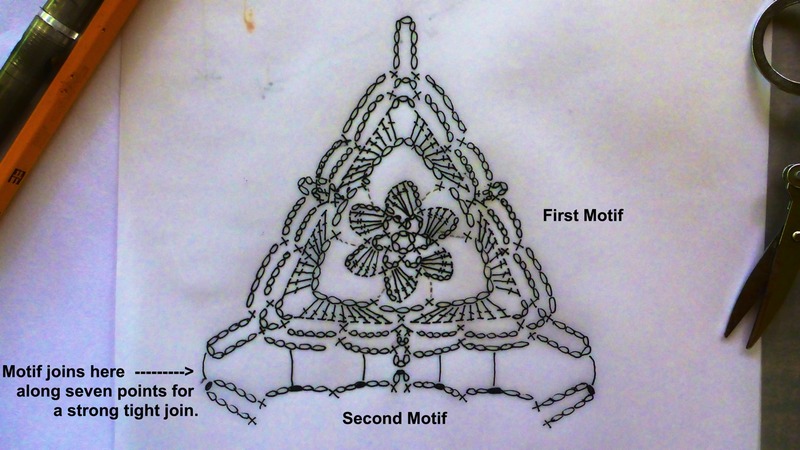 The motifs are joined to shape the garment. My original intention was to make a dress but I didn't have enough yarn. Perhaps next time I will try to use this motif to make a dress. It's a beautiful motif. Here is the finished top. This is very easy to make. I used adjustable straps and ties along the bottom of the top. The finished top is shown here on a 35" bust dress form, and it fits quite well. I have worn this top and I am a much smaller size 30" bust and the adjustable straps and ties help make the fit. Here's a detail of the straps at the front. 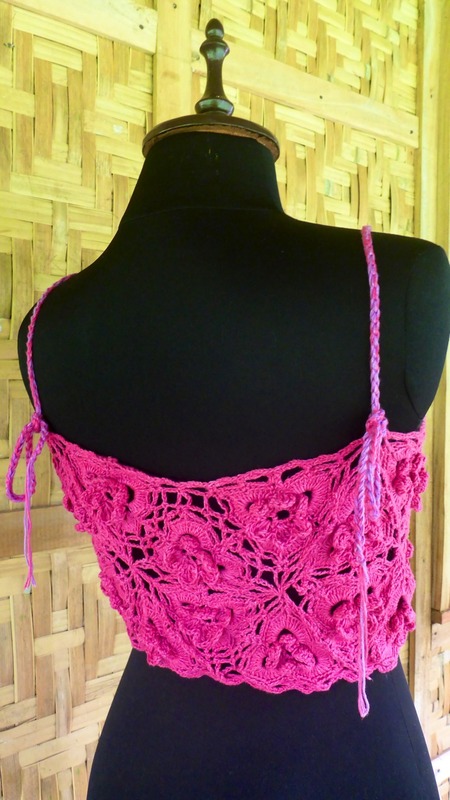 The tie consists of 2 strands of yarn in pink and 2 strands in purple, crocheted into a long chain of about 35 inches. The tie is woven along the neckline in front and tied to secure at the corners. The ends of the tie then go to the back and is knotted in place. This easily makes the garment adjustable for sizes 30" to 35" bust. 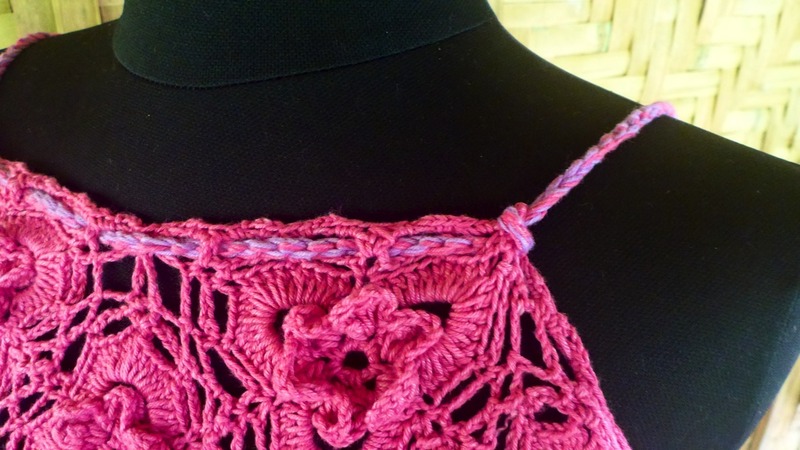 Detail of the tie knotted at the back of the top. You can tie into a bow or just a slip knot, you can embellish with beads of tassels if you like, etc. Back view of the triangle motif top. A closer look at the ties along the bottom of the top. 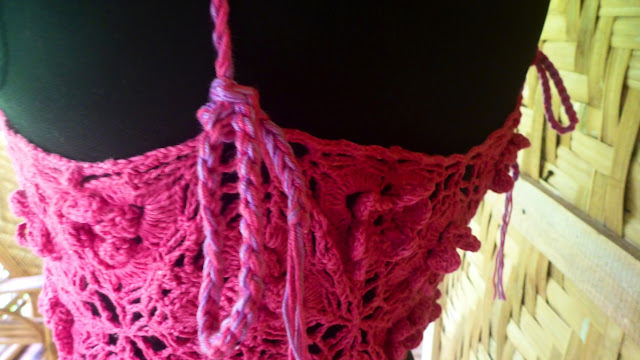 The tie consists of two strands of pink yarn (4-ply) crocheted into a chain at least 35 inches long. This is woven along the bottom of the top and ties into a knot in front. 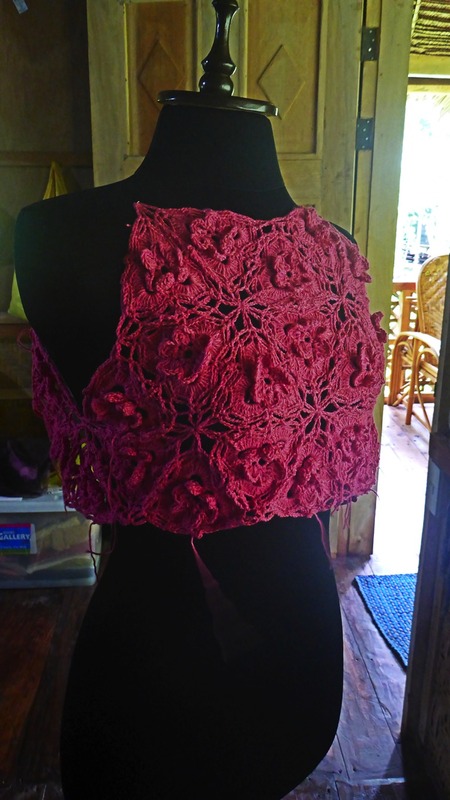 Side view of the finished top. CRUCIAL to the shaping of the neckline and armholes and the back of the garment is the crocheted trim that goes all along the edge. I have learned that how you make this edging determines the fit of the garment. For this top, the trim I made is simple single crochet : 2 sc in first space, sc2tog in first and next space, 2 sc in same sp, sc2tog in same and next sp, etc. I made two rounds of this trim along the edge of the garment at the neckline, armholes and back. 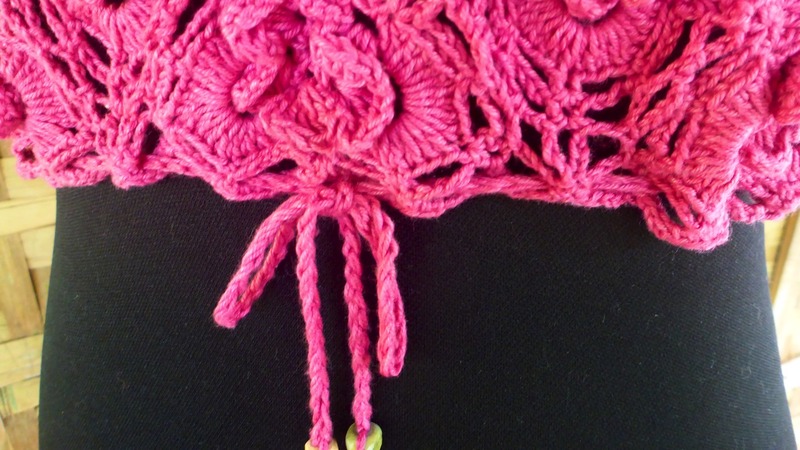 I used a different trim along the bottom of the garment: in each space make 2 sc, ch 3, 2 sc, etc.